Mrs. M found herself at home, unable to breathe. Her husband called 911 and she was rushed by ambulance to the emergency room. As her shortness of breath worsened, all she could say was “help me.” The medical team immediately jumped into action ordering blood work and a chest X-ray, placing an IV line and administering antibiotics. 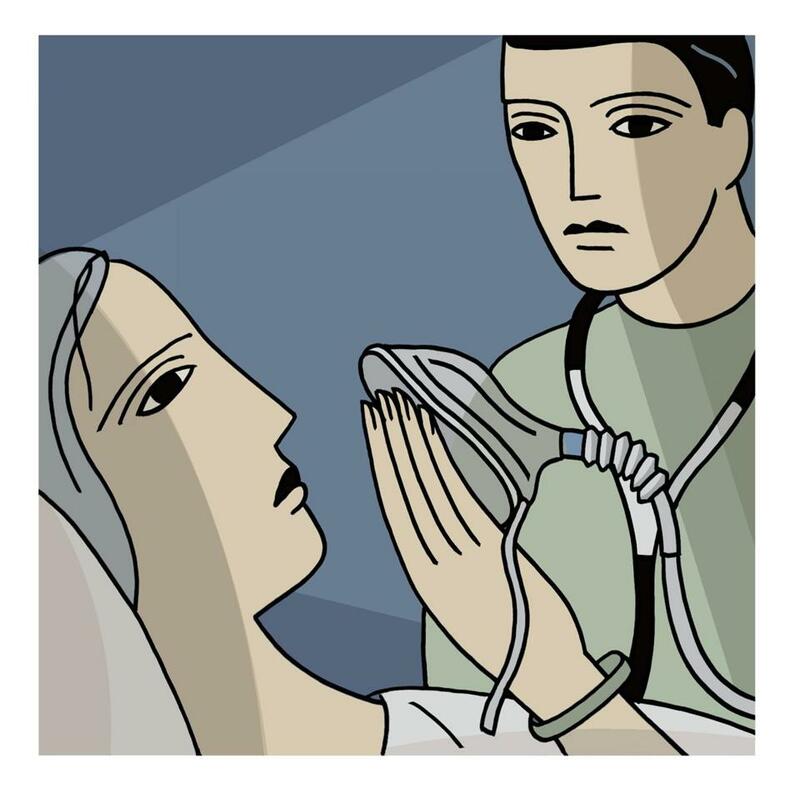 Eventually, anesthesia was called to insert a breathing tube and Mrs. M was placed on a ventilator because she could not breathe adequately on her own. Unfortunately — and unbeknownst to anyone present — this was not the type of help she sought. Mrs. M had spent the last few months under the care of a hospice nurse with whom she had developed a close relationship. On several occasions, she explained to this nurse that she had no desire to be placed on a ventilator again, as she had been so many times in the past. The next time her lung disease worsened, she wanted medicines to make her comfortable so that she would not feel the awful sensation of ‘air hunger’ that accompanied her severe shortness of breath. She knew that her lung disease was slowly killing her, and she hoped to spend her final days at home, comfortable and at peace, rather than in a hospital hooked up to a machine. To ensure that her wishes would be met, Mrs. M designated her husband as her official “healthcare proxy” should she lose the ability to make her own decisions. In Massachusetts, this involves signing a document designating a spouse, family member or friend to take responsibility for healthcare decisions if an individual is unable to do so. When we as doctors can no longer communicate directly with a patient due to mental or physical illness, we seek the advice of the healthcare proxy so as to best honor our patient’s wishes. While Mrs. M had outlined her desire for comfort-focused medical care to her nurse, she never broached this difficult subject with her husband. As a result, he was unaware that she never wanted a breathing tube or ventilator, or to be re-admitted to the hospital. Only later, after speaking with Mrs. M’s nurse, did he understand how much his wife had quietly suffered from her disease and why she hoped to pass naturally at home rather than in the midst of aggressive medical care. While many elderly and chronically ill patients designate an official health care proxy, few discuss their specific wishes should they later face life-threatening illness. As a result, when patients become too ill to make decisions for themselves, health care proxies are often overwhelmed by the tremendous responsibility suddenly placed in their hands. Ideally, these conversations should take place prior to the onset of severe illness. The more detailed the discussion, the more likely it is that a patient’s wishes will be honored — and the better equipped it leaves us as health care providers to provide appropriate care. Like many elderly and chronically ill patients, Mrs. M didn’t want to come to the hospital, though she wanted help for her shortness of breath. Had she and her husband discussed what “help” meant to her, she might never have been rushed to the emergency room and placed on the ventilator. Eventually, Mrs. M’s hospice nurse was able to help her husband understand his wife’s wishes. Mrs. M was disconnected from the ventilator shortly thereafter and given medicines to ease her breathing. She passed peacefully. Had Mrs. M and her husband discussed her wishes months earlier, perhaps with guidance from a physician, they could have come to terms with her illness together. Mrs. M might have spent her final days at home with her husband by her side, instead of in the ICU on a ventilator. Doctors have a duty to help facilitate such discussions. But, we are not doing as good a job as we should be. According to a recent article in The Boston Globe, only 17 percent of patients in Massachusetts report discussing end-of-life care issues with their physician. Most patients wish to die at home surrounded by family and friends. Unfortunately, statistics show that the majority die in the hospital. Why don’t we as physicians more readily initiate conversations about death with our patients? Several factors may be involved. Our fragmented health care system — in which a patient’s care is managed by multiple caregivers in a variety of settings — makes it challenging for any single physician to take the lead around end-of-life conversations. For instance, a sub-specialist may assume that the primary care doctor has already addressed the issue, while the latter expects the oncologist or cardiologist to discuss it in the context of treating a patient’s particular condition. Moreover, medical education emphasizes problem solving. We are taught to analyze information, determine a diagnosis and provide treatment to make our patients better. We are trained to do things. This is hard to reconcile with the notion that in some cases less treatment may actually be in our patients’ best interest. In medical school, I remember taking part in an exercise meant to teach us how to deliver “bad news” to patients. But, during my first year of residency I found that nothing had adequately prepared me for the more nuanced discussions regarding the many challenging choices that patients and their families face when approaching the end of life. It is something I have grown more comfortable with over the last three years and a conversation that continues to refine itself as I gain more first-hand experience. Perhaps most importantly, we as a society have an uneasy relationship with death. As physicians, maybe our most important role in end-of-life care is to continue to bring the conversation into the public forum. We must prompt our patients to speak with their loved ones about uncomfortable topics — including ventilators, resuscitation, feeding tubes, dialysis, and death. By asking the right questions, we can empower our patients to speak their minds honestly to their chosen proxy. Left to make decisions on their own, family members are often driven by guilt or fear. If we as physicians help our patients understand this, they can begin to have meaningful conversations with their loved ones that ensure the care they receive reflects their deepest beliefs and values.